The 20th edition of gaming's signature sports simulation sells us a big-tent philosophy - dueling difficulty settings that will level the playing field between lifelong players of Madden football and more casual gamers who just want in on the fun without reading a playbook the size of an encyclopedia. As a business strategy, a more inclusive Madden makes a ton of sense. But that innovation underachieves in single-player mode and, online, it's not much use to advanced players and it seems more to drag out competitions between the equally bad ones. That's not to say Madden NFL 09 is a failure or a warmed-over roster update. It is by any objective measure the best version of the game since Madden ‘05, which was the game's apotheosis on 2nd-generation consoles. Madden 09's outstanding presentation will please lifelong adherents, and its remarkably accurate replay analysis will educate newcomers and encourage those returning to the series. Foundationally, this version begins the title's next generation. But in gameplay, it takes safe but incremental steps toward the classic, impossible goal of a sports title: Creating realistic competition that is challenging yet winnable. If you are not an experienced player, Madden ‘09 skews toward winnable, but it doesn't leave you feeling like you played your best.Loved: Backtrack: A mistake play brings up an animated breakdown that points out the error you made and exposes the alternatives you had. It's remarkably accurate for a first effort. A sports simulation really shines when it teaches people something about the game as it is played in real life. 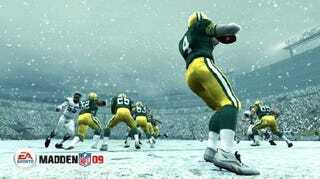 Madden ‘09 has always led that effort, and takes another strong step forward with this feature. Rewind: As a single-player device only, this is a great addition. Rewind allows you a do-over for one particularly egregious play (or more, depending on your settings). Its purpose is to save perfectionists from themselves and keep them playing the game rather than starting over. Improved ball-running controls: Beginning this year, when a tackle animation starts you can lay on the buttons or the right stick to spin, stiff-arm or sprint loose from the tackle. In time you'll develop your own go-to set of control choices. Fighting for your yards is a rewarding feeling and deepens the game's authenticity. Cris Collinsworth: Widely considered the class of NFL analysts, he is no less than that on Madden 09. His familiar, natural delivery is a part of every play and it matches well with the onfield action. Collinsworth will also startle you with his accuracy in the Backtrack commentary, especially when he says you were staring at a single receiver the entire time. Collinsworth, in substance and style, is more than a good analyst. He's an upgrade from Madden himself. Presentation: When the franchise calendar hits November you'll play with long shadows under foot and leaden skies overhead, and it lends a different quality of light to the turf and the stadium surroundings, especially when the lights are on at twilight. After four quarters of rain, your uniform will be unidentifiably filthy. All it lacked was dirt clods in your face mask. In post-play animations players help each other up, swoop to and run with dislodged balls after the whistle, or shove and jaw at one another. All of these things extend the immersive experience striven for and built on in previous versions of the game. Hated: Adaptive difficulty: I don't literally hate the concept, certainly don't think it should be stripped from future versions, but I'm not sold yet on the idea that Madden 09's AI really adapts to your skills. Online single matches tended to come down to the final two series and not a one of them came close to being the kind of well played epic you imagine when the game is decided on the final drive or in overtime. It's like the football equivalent of a "My kid is a terrific kid" bumper sticker. The diagnostic tests that set your "Madden IQ" at the beginning of the game are way, way too easy. My original tests put me as an all-Madden level runner and I am nowhere near it. You're inevitably starting the game overrated in one or more categories, and failing at it to bring your AI down to a more reasonable level is both time consuming and not fun. You're better off sandbagging your diagnostics and letting your Madden IQ rise and fall according to your in-game performance, or just playing on its standard pre-set difficulties. In conversation, online gamers to a man expressed no confidence in or understanding of how Madden IQ either moved or affected gameplay beyond anecdotal assumptions. Tom Hammond: The new play-by-play man is not at all natural in this environment. The substance of his call is very generic, routinely omits players' and team names, and his tone is almost always mismatched to the play or the circumstance. Even the between-plays endorsement of EA Sports is off. He needs work, because right now he sounds like C3PO. Artificial Stupidity: This is nothing new, and is perhaps more of a concern for singleplayer than multiplayer. But the offensive line's AI is still, year after year, utter crap. Draw plays and screen passes are useless, making obvious passing downs even more obvious. Defenses are helpless against the slant route. But the game really is long overdue for better offensive line play. I would have no problem if the Madden 10 cover boy was Alan Faneca or Matt Light or Jeff Saturday and the game touted revolutionary offensive line AI and pre-snap adjustments, which seem entirely gratuitous as of now. But linemen don't sell video games. Madden ‘09 offers to date the most inclusive experience ever for a sport so complex and inscrutable as American football. But it's based entirely on execution, when so much of the game is about decision-making before the snap. The game has always been given to information overload and a myriad of choices that lack context. Still, longtime gamers have coped with that for years, developing their own systems; neophytes won't really care and will accept the spoonfeeding; and those coming back to the series after a few years will get a warm welcome from the game's AI and find strong value for their dollar. But you get what you give to this game, and if you are expecting Sunday afternoon realism, you still need to give a lot to help create that experience. Madden ‘09, developed by EA Tiburon, published by EA and released Aug. 12. Retails for $59.99. Versions available on PlayStation 3, Xbox 360, PlayStation 2, Xbox, Wii, Nintendo DS and PSP. Reviewed on Xbox 360. Played singleplayer franchise mode for a complete season into the playoffs and played online multiplayer single-game mode.